Introduction: What Has Gone On? “Crash” is a very emotive word. In our profession (REALTORS®), we use the word “correction” which is a more scientific descriptor of our local real estate market since 2014. 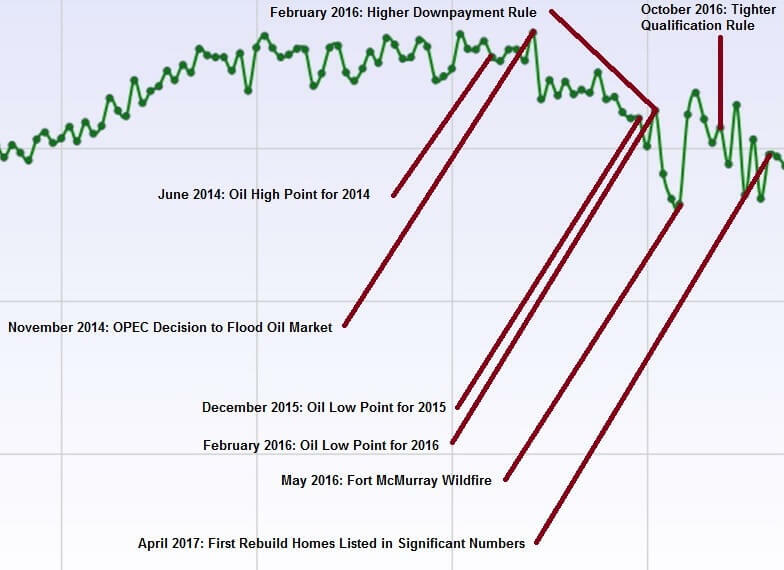 “Fort McMurray Real Estate Forecast” is NOT the title of this post. I won’t attempt to predict the future of the market; in this post I will bring you up to speed as to what has gone on thus far during the correction1. I will try to shed some light on what has gone on so readers can better understand the local real estate market. This graph represents the median sale price, each month, of (mainly) single family homes and duplexes (without condo fees) in urban Fort McMurray over the last 10 years. See the crazy footnote “2” for more details. In my mind and experience, there are three main groups of causes which may have had effects on supply and/or demand, and therefore prices. Oil: Fort McMurray’s economy is resource-based: We live in an oil town, and the income of families is determined by the oil price through the mechanisms of employment income, benefits and the level of employment. Wildfire: Our town has been deeply affected by the desperately sad 2016 wildfire. Government & Monetary Policy: Thirdly, the Government of Canada and Bank of Canada have taken a hawkish approach on the housing market over the time period 2014-2017 which has impacted family budgets and expectations. 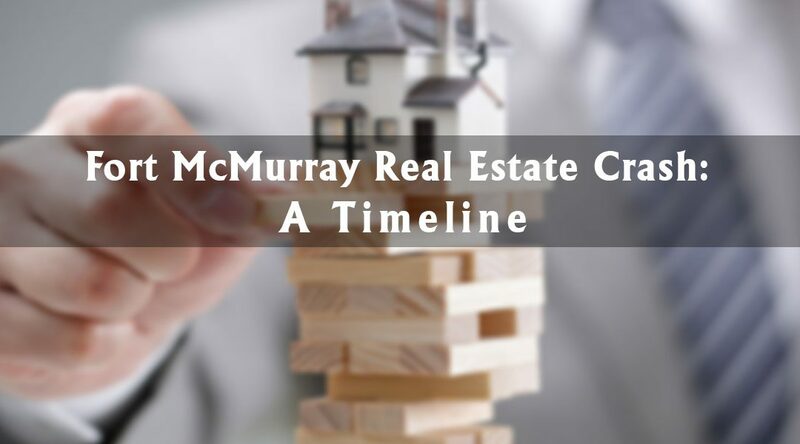 Let’s look at the events which might have impacted supply and/or demand for Fort McMurray homes during the correction to date. At the start of the period of study, we have oil (WTI) at $107.95 on June 20th, 2014. What was Fort McMurray like at the time? Full employment, high and stable wages, the majority of land owned by a handful of organizations, high rates of capital flow into the region, large infrastructure projects nearing completion and an investment-friendly political climate. On November 27th, 2014, Saudi Arabia stopped OPEC from cutting production to prevent a glut of oil. The policy change meant that the Kingdom of Saudi Arabia and the US shale oil producers would enter a game of chicken. Who would blink first? Would Saudi Arabia change back because of political unrest or rapidly emptying government coffers, or would US shale companies limit production (or go bankrupt) due to flagging prices? In the end, the US shale producers would win out, but in the meantime, a vast global oil glut grew, causing prices to crash. Since then, they have largely been range bound ($40 to $60 per barrel) until the time of writing. In Fort McMurray, demand for homes fell immediately by approximately 50% after the policy change due to hiring freezes and layoffs which resulted in the disappearance of confidence. The local (incorrect) consensus was that the oil market would correct itself within months. As a result, the public did not rush to list their homes for sale. When the rate of families listing their homes did tick up, it was compensated for by the virtual ceasing of all new construction. The price correction was caused by a lack of demand, not an oversupply. Therefore, prices fell steadily during 2015 by approximately 0.8% a month. WTI fell to $26.19 on February 11th, 2017. As a result, rather than seeing a return to investment, oil producers cut budgets (and workforces) further and shelved projects. Capital took flight from the oil sands. This period was dominated by political uncertainty surrounding industry taxation, government spending and pipeline politics. During the period January to April 2016, Fort McMurray home prices suffered their greatest losses of the correction (approximately 2% a month). As in 2015, this was not due to an oversupply of homes on the market. Instead, it was due to anaemic demand. During these months, the number of homes changing hands was down 50%-70% vis-a-vis the same months two years previous. On February 15th, 2016, the Government of Canada increased the required down payment for most home-buyers of homes between $500,000 and $1,000,000. This was implemented to reduce demand in the overheating markets of Vancouver and Toronto. Like those cities, the Fort McMurray housing market was characterized by high prices3. That made Fort McMurray collateral damage. It’s only anecdotal evidence, but in my experience as a REALTOR® 2012-2014, the majority of my clients had purchased their homes with 5% down. Buyers such as these would now need to defer their purchases until they could save the new, higher minimum down payment to buy the benchmark Fort McMurray home. Some saved, some lowered their budgets and others presumably decided not to buy at all. This added to the demand problem. Aside from the agonizing human impact that the fire had on families, it has also had an effect on the housing market. 2,600 homes were destroyed and an estimated 5,000 community members ultimately decided not to return. It is also resulting in a construction boom. When the fire swept into the area last May, more than 80,000 people evacuated, and includes those who were living and working at oilsands camps outside of the city. Officials with the Regional Municipality of Wood Buffalo estimate that around 5,000 Fort McMurray residents have not returned since the fire, but it is difficult to get an exact figure. The city’s population has always fluctuated with the booms and busts of the resource economy and before the fire hit, the region was already struggling through a downturn. In June, July and August of 2016, inventory fell and remained lower than the 10-year average due to homes being lost or temporarily delisted. At the same time, demand ran high as people bought homes to replace those they had lost. It was a brief seller’s market and prices rose. In the following few months, supply and demand returned to their previous mean. That is, there was a return to a buyer’s market due to the underlying economic malaise in the oil industry. It’s possible that the full extent of the fire may not have yet been realized: The rebuild continues (housing is becoming available), but the inflow of families has narrowed from a flood in 2016 to a trickle in 2017. The fire has also caused the market for vacant lots to become more competitive which tends to bring down lot prices as sellers and groups of sellers (e.g. developers) lose some of their price-setting power. On October 17th, 2016, a new Government of Canada rule came into effect which made it harder for people with less than 20% down to qualify for a mortgage. This (large) group of buyers’ budgets has been significantly eroded. More can be read about this change here. Anecdotally, during the boom, I would often help typical buyer clients (e.g. new hires with Suncor and Syncrude) purchase homes in the $700,000 to $800,000 price range. Today, my buyer clients with a similar profile tend to purchase in the $400,000 to $600,000 price range, sometimes due to increased risk aversity and at other times due to their budget being limited by recent government policy, or both. Furthermore, this “typical buyer” of the past has been replaced somewhat by buyers with a different profile: People who work in town in secondary and tertiary industries (with lower incomes). 7) April 2017: First Rebuild Homes Listed in Significant Numbers. This year, we have seen a slight uptick in demand (probably due to lower home prices), however in recent months, a supply of newly rebuilt homes has also appeared. Overall the rebuilds have not yet had a game-changing impact on supply. Inventory is still very much in line with the 5-year average for this time of year, and the supply-demand imbalance is still caused by low demand. It’s hard to write this piece non-emotionally because we all know so many families in difficult situations. But this post is what it is: A history of the correction so far. All A-Team agents are well-versed on the market, so please don’t hesitate to ask yours (buyer agent or listing agent) for advice on the state of the market today. I hope this article helps you! The median selling price of homes in each month over the last ten years. All freehold properties have been selected (those without condo fees) with the exception of vacant lots, mobiles & modular homes. The data covers only the following areas: Abasand, Beacon Hill, Dickinsfield, Downtown, Eagle Ridge, Grayling Terrace, Henning Ridge, Parsons North, Prairie Creek, Stone Creek, Thickwood, Timberlea, Waterways and Wood Buffalo. In the previous year, approximately 67% of transactions in our marketplace had fallen in that price range. Good article Tom, it has also had another effect that may not be as obvious to the general public. People with homes bought 5 years ago coming up for renewal of their mortgage now face the fact that their homes have dropped below what they owe. Two homes we have had appraised in the last 3 months have come in at approx 100000 below their purchase price in 2012. This means the client has no option to move their mortgage to another lender who may be offering a better rate. As you stated most of them would have purchased with 5 percent down payment so have now seen a complete erosion of the equity. That’s very true Len, thanks for your input. Typically when we perform market analyses for our clients, they come in $100,000 to $180,000 below their 2012-2014 peaks. Great article and historical graphs mate. Our family purchased a sweet overpriced 2 storey on Fireweed Cres April 10/2014….Yay! On the bright side I suppose it is always darkest before dawn. It’s probably time for the RMWB to seriously consider yoinking all new development permits. Imagine all that beautiful cleared land in Parsons Creek being utilized as the worlds largest community garden? Or a massive world class off leash dog park? Anything but an oversupply of housing to further exacerbate the price plunge. I understand why the Fed’s are freaking out about the overheated housing markets, as much as I despise the Libs their efforts to cool the markets are intelligent. Being $100k underwater in a mortgage and precariously employed is a pretty terrible lifestyle. 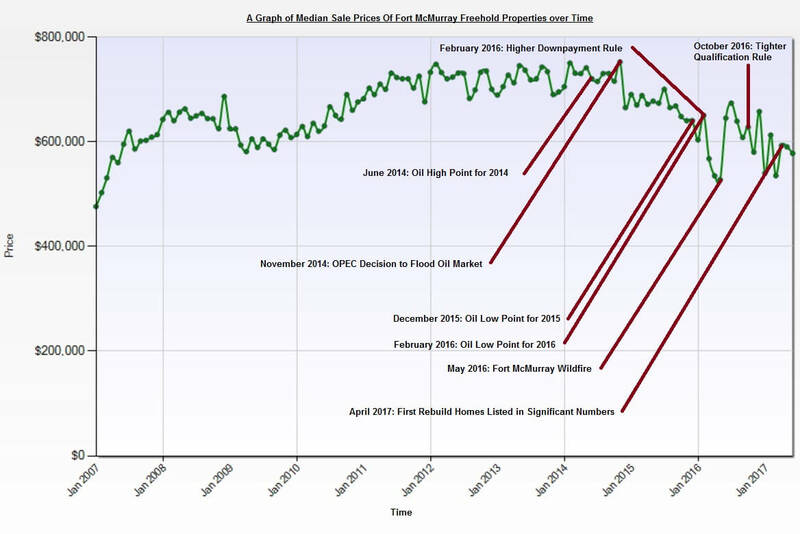 Best buying opportunity Ft McMurray has seen in 15 years though. Well written Tom. Let’s hope it all picks up, there in Fort McMurray. Thanks Gary. Since the time of writing there has been a downward adjustment in inventory which is significant, and a tick up in sales which could be temporary or more permanent (we will find out). Regardless, less negative for prices. Please keep in touch.